Hard-anodized cookware is relatively new to the market compared to stainless steel and cast iron. With this new innovation, you get professional quality cookware with a professional look with the lightness of aluminum. This new style of cookware is fast becoming the best-selling style of cookware being purchased today. Hard-anodization is a process that hardens aluminum through electro-chemical interaction. During the process, aluminum is submerged into an acid bath and then subjected to electrical charges. A chemical reaction occurs that oxidizes the surface of the aluminum, forming aluminum oxide. This process is a controlled acceleration of the natural process of oxidation. What this process does is make the aluminum 30% harder than stainless steel while retaining the light weight convenience of aluminum. The benefit of hard-anodization is that it makes the cookware resist corrosion and abrasion. This cookware is extremely durable and enjoys a very long life span. These surfaces do not chip or peel, and this process is actually used to protect the surfaces of satellites from the harshness of space and to harden automotive motor parts in race cars to protect them against heat and friction. in fact anodized pans are heat-resistant to the melting point of aluminum, which is 1,221 degrees Fahrenheit. Hard-anodized cookware is also very smooth, making it naturally stick-resistant. The anodizing process actually affects the pan itself, becoming part of the pan. It is not just a coating. The inner aluminum core conducts heat very well and cooks very evenly. This core runs through the entire pan, not just the base. This creates an even heat throughout the pan that warms very quickly, although the handles stay relatively cool. Hard-anodized cookware also browns meat very well and it stands up to acidic foods like tomatoes really well. Anodized aluminum works well for sautéing, searing and glazing as well as steaming and simmering. There are a few key things to keep in mind when cooking with your hard-anodized cookware. You will need to add oil or butter to keep food lubricated while cooking. Do not use cooking sprays, as they will create a layer of goo in the bottom of the pan that is difficult if not impossible to remove. Preheat your pans when cooking, and don't put frozen food directly into a hot pan. The cookware is heavy, so be careful when moving hot pans full of food. Another factor to keep in mind is this cookware does best when hand-washed. Detergents from the dishwasher may discolor the surface. If food is stuck, just soak with a little warm soapy water before washing. Make sure to use a mild dishwashing soap along with a sponge, dishcloth or nylon pad. After washing rinse in warm water and towel dry them thoroughly to prevent water spotting. If you do get stains on your cookware, use baking soda and water to make a paste. Rub this paste on the stained area with a nylon pad and then let it set for thirty minutes. Then wash, rinse and dry. For those that want this type of pan that can go in the dishwasher, Circulon's Infinite line states they are made to be washed in the dishwasher as well as suitable for all types of stoves, including the latest glass and induction cooktops. Cuisinart , Calphalon and Anolon have also come out with infused hard-anodized cookware that infuses a nonstick surface onto the extra-hard interior. Tests have shown they keep their nonstick coating three times longer than standard nonstick cookware. You could say that you can have the best of both worlds this way. 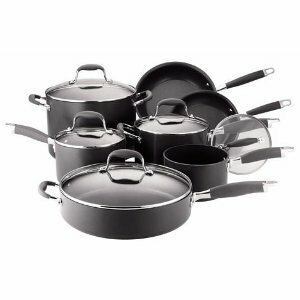 The hard-anodized cookware isn't cheap, but it does fall well under the prices of other high end cookware like All-Clad. Most companies that manufacture the anodized aluminum cookware offer very generous warranties that are only voided by putting the pots into the dishwasher or other obvious indiscretions. Anodized aluminum cookware will be durable enough to pass down from generation to generation.